View cart “Catching Fireflies” has been added to your cart. Poetic songwriter-singer , Serah creates music that explores many of the most important aspects of our lives including love, peace, harmony, success/failure, relationships, religion, nature, connectedness, healing and emotions. 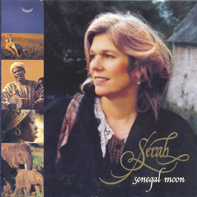 Serah explores these and other important themes with contemporary music that showcases her own unique folk-pop style that also blends together elements of new age, jazz and African world music. Serah’s music draws from her experiences of having lived on both coasts of the United States as well as in Canada, France and Africa. She works closely with a wide variety of musicians from around the world which gives her music an international flavor. Serah is an award-winning vocalist and lyricist with several hit songs and a cache of critically acclaimed albums. According to her grandmother, Serah was singing before she talked. 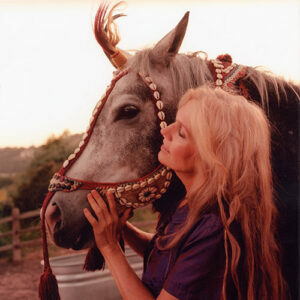 She learned guitar at age 10 from a cowboy, and performed at social events as a teenager. Later, her first professional appearances were at the Main Point in Philadelphia, which led to international touring with Jonathan Edwards (“Sunshine”). Her first album “Rainbow Reign”, released in Canada, (as “Carolina Edwards”) included her hit single “Nova Scotia” rising to No. one on the charts. In the 80’s, Serah lived in Kenya taking her guitar everywhere, she worked with family and friends to help find homes for orphans. Her experiences there and in France inspired Serah’s next album, “Flight of the Stork”, heralded as “record of the year by Europe’s “Stereoplay”. It was chosen by the Hunger Project to be presented in 1991 to Mikhil Gorbachev. In 1999, Serah performed at the United Nations “Hague Appeal for Peace”, and in 2003 at the United Nations “World Water Rescue.” Serah records in France and America and has consequently released “Senegal Moon”, “Late Harvest” and “A Thousand Candles” — her best works to date. 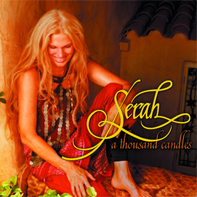 With passion and compassion, Serah sings and writes songs of world consciousness, poetry, peace, and healing. Serah has lived in East Africa, France, and Canada, providing her with in-depth exposure to numerous cultures. To listen to Serah's music is to meet Serah herself. Openhearted, generous, deeply emotional, and creatively true, her music is an act of connection and compassion. Take Flight with the Musical Inspirations of Serah. An acclaimed composer and singer, Serah crosses musical borders to create a genre unique in itself. Her broad experience and gift for musical alchemy produces a sound which is calming, eclectic, refreshing, and unique all in one. Her clear, soft vocals are a perfect complement to her thought- provoking lyrics that enthrall and charm all of her listeners. Working with Grammy Award-winning producer Neil Dorfsman (Sting, Dire Straits, Bruce Hornsby), Serah breaks through the boundaries of Pop and World music, defying single-format classifications. After hearing your music Serah I know that healing is also aided by beautiful music. Words that cannot be expressed that are simply placed in harmony and expressed for the world to hear. This I find is very beautiful!! Thank You So Much! Very sunny and organic, well traveled and gentle.